The Web Foundation has been awarded the 2016 GEM-TECH prize for its work to develop gender-responsive Information and Communication Technology (ICT) governance, policy, and access, reports ITRealms. The award, ITRealms gathered is an annual prize organized by the International Telecommunication Union (ITU) and United Nations (UN) Women, in recognition of efforts at promoting women’s Internet access and online empowerment through A4AI and the Women’s Rights Online programme. 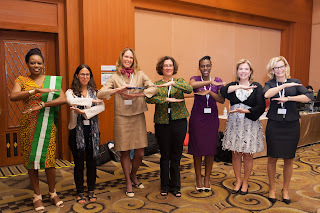 These efforts, ITRealms reports, include activities such as the first-ever summit to focus on policy’s role in bridging the gender digital divide in Africa and the development of scorecards to assess policy efforts in 10 countries. The Chief Executive Officer, Web Foundation, Anne Jellema, was at hand to accept the award at the just concluded ITU Telecom World in Bangkok.